Knoppix 8.1 DVD | Linux DVD Shop - UK Linux Shop supplying Linux on CD, DVD and USB with Free UK Delivery, 24Hr Dispatch. Knoppix Linux 8.1, out now on DVD. 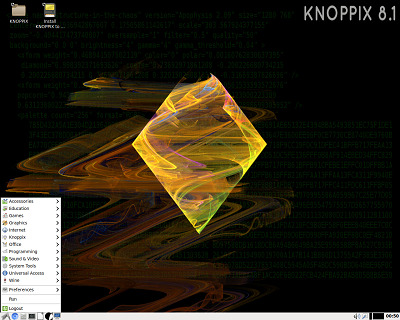 Knoppix Linux was the first ever bootable Linux CD, it now includes an even bigger collection of software for Linux boasting over 6000 programs on the DVD that allows a full operating system to be run Live from the DVD and memory or a full installation of the operating system can be performed too. Knoppix Linux is a great no risk trial to see what Linux really can offer and the huge volume of quailty free software available, most on this DVD! Features include automatic hardware detection, support for many graphics cards, sound cards, SCSI and USB devices and other peripherals. Knoppix Linux can also be used as a Linux demo, educational DVD, rescue disk or adapted and used as a platform for commercial software product demos. It is not necessary to install anything on a hard disk. Knoppix runs Live so great for testing, with an additional install function, plus 32-bit and 64-bit options on the same DVD too!